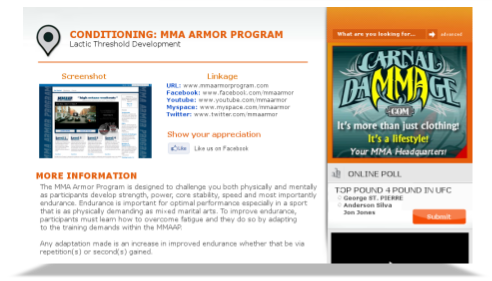 Join us for FREE and build your own MMA Profile to take advantage of free traffic in the Mixed Martial Arts community. It only take 5-10 minutes to secure your spot. Again, this offer is FREE! Take advantage of the offer while it lasts. By creating a listing on MMALinks.com you will be putting your Mixed Martial Products and Services in front of thousands of already eager MMA Fans and Enthusiasts who are looking for what you have to offer. If we have any questions we will contact you using the details provided. Don't worry about formatting this text. This text can be edited later. if you would like to copy and paste text to this area use (CTRL + V). This is the username and password used to access your profile. We suggest you not share it with anyone other than the person responsible for updating your profile. Pick and Choose your own meta tags and keywords. Create links back to your web site. Free Placement in any one (1) category of your choice. Manage your own listings with 24/7 access. Quality Back Links to Your Official Website.